As part of the Finished Object- friday I present you today a bright thing. Be warned: put on your sunglasses! When it comes to colourwork or colour combos Jettshin is my hero. I have to admit, when I saw Jettshin’s Japan Sleeves (picture above), I knew I had to knit this pattern too. And especially in this bright orange. This is totally my colour! Of course the yarn and this specific colour wasn’t available in Switzerland, An american knitting friend visited her parents in the States. So I could send a parcel to her parents. It’s so good to have friends like that…. I used a slightly darker grey to get more contrast. The construction of this sweater is unsual. You knit first two lace rectangles. The lace pattern itself is difficult, because it’s not logical and you have to pay attention while knitting. 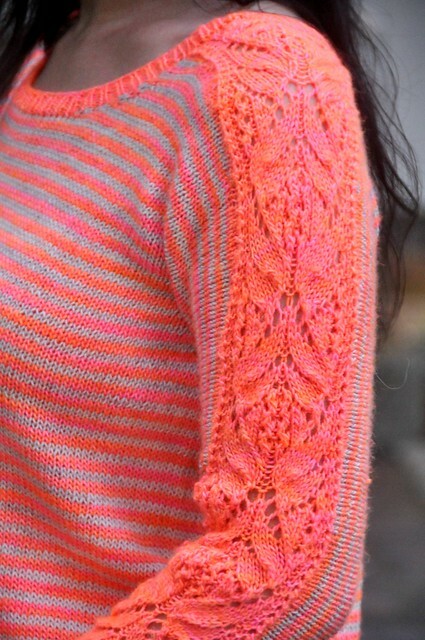 No good idea to bring the lace to our weekly knit’n’sip nights… Tell me how I know it. Once you’re done with the lace part, it’s a breeze. You pick up the stitches along the rectangles. The sleeves are shaped by short rows. Then you bind off the sleeve stitches by a 3 needle bind off. The body is plain stockinette – knitted in rounds. As usual I did some modifications. You can read them on my Ravelry project page. Do you have a knitting hero? Which person is your knitting muse? Do you have several muses? Super. Und ich habe gar nicht deine letzten Blogeinträge gelesen. Jetzt werde ich mich “updaten”. Es war schön, dich live in diesem Pulli zu sehen.